In this exercise, an AWS account owns a bucket, and it has an IAM user in the account. The user by default has no permissions. The parent account must grant permissions to the user to perform any tasks. Both the bucket owner and the parent account to which the user belongs are the same. 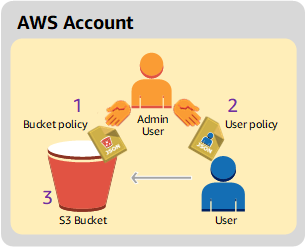 Therefore, the AWS account can use a bucket policy, a user policy, or both to grant its user permissions on the bucket. You will grant some permissions using a bucket policy and grant other permissions using a user policy. Account administrator creates a bucket policy granting a set of permissions to the user. Account administrator attaches a user policy to the user granting additional permissions. User then tries permissions granted via both the bucket policy and the user policy. All the tasks of creating users and granting permissions are done in the AWS Management Console. To verify permissions, the walkthrough uses the command line tools, AWS Command Line Interface (CLI) and AWS Tools for Windows PowerShell, to verify the permissions, so you don't need to write any code. Make sure you have an AWS account and that it has a user with administrator privileges. Sign up for an account, if needed. We refer to this account as Account A. Go to https://aws.amazon.com/s3 and click Sign Up. Create user AccountAadmin and note down the user security credentials. For instructions, see Creating an IAM User in Your AWS Account in the IAM User Guide. Grant AccountAadmin administrator privileges by attaching a user policy giving full access. For instructions, see Working with Policies in the IAM User Guide. Note down the IAM User Sign-In URL for AccountAadmin. You will need to use this URL when signing in to the AWS Management Console. For more information about where to find it, see How Users Sign in to Your Account in IAM User Guide. Note down the URL for each of the accounts. If using the AWS CLI, create a profile, AccountAadmin, in the config file. If using the AWS Tools for Windows PowerShell, make sure you store credentials for the session as AccountAadmin. For instructions, see Setting Up the Tools for the Example Walkthroughs. In the Amazon S3 console create a bucket. Note down the AWS region in which you created it. For instructions, see How Do I Create an S3 Bucket? in the Amazon Simple Storage Service Console User Guide. For instructions, see Creating IAM Users (AWS Management Console) in the IAM User Guide. Note down the UserDave credentials. Note down the Amazon Resource Name (ARN) for user Dave. In the IAM console, select the user, and the Summary tab provides the user ARN. Because the bucket owner and the parent account to which the user belongs are the same, the AWS account can grant user permissions using a bucket policy, a user policy, or both. In this example, you do both. If the object is also owned by the same account, the bucket owner can grant object permissions in the bucket policy (or an IAM policy). In the Amazon S3 console, attach the following bucket policy to examplebucket. The policy has two statements. The first statement grants Dave the bucket operation permissions s3:GetBucketLocation and s3:ListBucket. The second statement grants the s3:GetObject permission. Because Account A also owns the object, the account administrator is able to grant the s3:GetObject permission. In the Principal statement, Dave is identified by his user ARN. For more information about policy elements, see Access Policy Language Overview. Create an inline policy for the user Dave by using the following policy. The policy grants Dave the s3:PutObject permission. You need to update the policy by providing your bucket name. For instructions, see Working with Inline Policies in the IAM User Guide. Note you need to sign in to the console using Account A credentials. Using Dave's credentials, verify that the permissions work. You can use either of the following two procedures. Update the AWS CLI config file by adding the following UserDaveAccountA profile. For more information, see Setting Up the Tools for the Example Walkthroughs. Verify that Dave can perform the operations as granted in the user policy. Upload a sample object using the following AWS CLI put-object command. The --body parameter in the command identifies the source file to upload. For example, if the file is in the root of the C: drive on a Windows machine, you specify c:\HappyFace.jpg. The --key parameter provides the key name for the object. Execute the following AWS CLI command to get the object. Store Dave's credentials as AccountADave. You then use these credentials to PUT and GET an object. Upload a sample object using the AWS Tools for Windows PowerShell Write-S3Object command using user Dave's stored credentials. Download the previously uploaded object.